Vacation used to be a stressful time for me. Oh, I looked forward to vacation like anyone else. But if the vacation plans included travel and spending time far from home I worried about my guitar playing. Would I be able to play at all? The problem first arose when I was 15 years old and my father brought our family with him on a business trip to New York City. 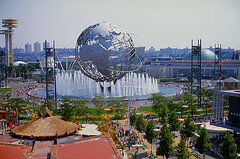 The trip was during the New York World’s Fair (1964). I was in full guitar immersion mode at the time of this vacation. I generally spent a minimum of an hour each day playing guitar during the school year. On weekends I could play guitar with my buddies for 8 hours or more – until there was no feeling left in my fingertips except a dull pain – in spite of calluses on my left fingers that seemed like steel plates. Although my fingers never bled like Stevie Ray Vaughan’s were alleged to do, they sometimes hurt for days after a weekend of playing. I was somewhat compulsive about playing guitar every day and had gone over two years without missing a single day of guitar playing. I admit that sometimes I allowed picking up a guitar and strumming a chord three times to count as a day with guitar playing for my unbroken streak. There was no chance to bring my guitar on the trip. My parents, my two brothers and myself drove from Chicago to New York in a station wagon. I doubt my dad would have permitted the guitar even if there had been room. We were in New York for about a week (my memories are vague on this). I also remember, if also somewhat hazily, doing normal tourist things like visiting the World’s Fair, the Statue of Liberty, the top of the Empire State building and so on. But what I remember most was trying to figure out how to play guitar each day. I managed to visit music stores or department stores with guitars on several days so I could strum my three chords. I think I only missed two days of guitar playing during the trip. I have much better options now when it comes to vacation and travel with guitars. I have both an acoustic and an electric travel guitar. I am also less compulsive about playing every day then I was at 15 and sometimes (gasp!) go several days without playing the guitar (when I have to). I can thus go on a short trip and (almost) not worry about missing the guitar playing. I have shared some of my experience, thoughts and recommendations regarding travel guitars and vacations in the post, “Vacation Guitars“. Worlds fair image. Attribution-NonCommercial-NoDerivs 2.0 Generic. Title: 1964 New York World’s Fair. Station wagon image. Attribution-NonCommercial-NoDerivs 2.0 Generic. 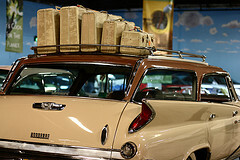 Title: CA Auto Museum 071. Guitar store image. Attribution 2.0 Generic. Title: Ludlow Guitars (NY City).